Sitka Gear designed the Cloudburst Pant with a single philosophy in mind: Miserable weather should never turn hunting into a miserable experience. they spared no detail in developing a pant that maximizes comfort and ease of use for dedicated big game hunters. The lightweight, 2-way stretch GORE-TEX® Fabric is Guaranteed to Keep You Dry®. Sitka Gear designed the Cloudburst Pant with a single philosophy in mind: Miserable weather should never turn hunting into a miserable experience. 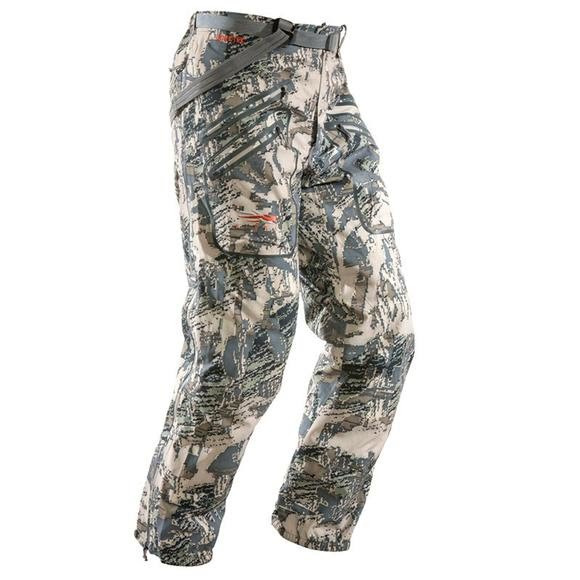 they spared no detail in developing a pant that maximizes comfort and ease of use for dedicated big game hunters. The lightweight, 2-way stretch GORE-TEX® Fabric is Guaranteed to Keep You Dry®. The face fabric, an abrasion resistant 2-way stretch polyester weave, is durable and allows the pant to move with you as you push through the torrent. All zippers are welded and watertight, which is significant, since there are a lot of them on the Cloudburst Pant. The full side zippers make for easy on and off in rapidly changing conditions, and can be used for ventilation during periods of high exertion. Four zippered hip pockets eliminate the need to dive into your pack or midlayers to retrieve key gear. Elastic cuffs seal out the elements. With all these features, the Cloudburst Pant remains incredibly light and packable, so you don&apos;t have to second guess whether to bring them along.